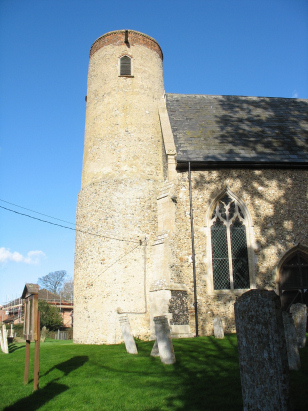 The parish of Wacton lies in south Norfolk about 12 miles south of the city of Norwich and just south-west of the village of Long Stratton. The parish is just west of the A140 which links Norwich with Ipswich. The village is a curious "S" shape of houses in the lanes between the busy road and railway. A tributary of the the River Tas gives some variation in elevation in an area that is notorious for being a broad agricultural plateau. All Saints church lies in the northern arm of the "S" and is set back behind houses. 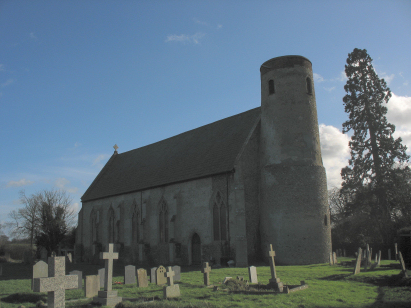 The church is old as distinguished by the round tower which dates from the 12th century albeit topped off with a much later brick parapet. The rest of the church is of the Decorated period from the early 14th century. A single standard 800-entry register book covers the period of the transcript and beyond, this being a rather lightly populated parish. This book is filmed on microfiche 6 in the collection of the Norfolk Record Office and from which this transcript was prepared. The fiche is rather elderly and images are not to modern filming standards. However despite this constraint the quality of the images and the standard of handwriting is for the most part adequate to producing a clear image. This was, as a consequence, a relatively straightforward transcript to prepare and it is hoped few errors will have crept into its production.